On 13 December AD 115¹, Hadrian survived a violent and devastating earthquake while wintering in Antioch during Trajan’s campaign in the east. Hadrian had been in Syria since January AD 114 as imperial legate (envoy to the emperor), and as such, had taken up residence in Antiochia ad Orontem (Antioch on the Orontes). The city served as headquarters for the Parthian wars. Trajan had returned from a campaign in Armenia when disaster struck in the morning of December 13th of AD 115. 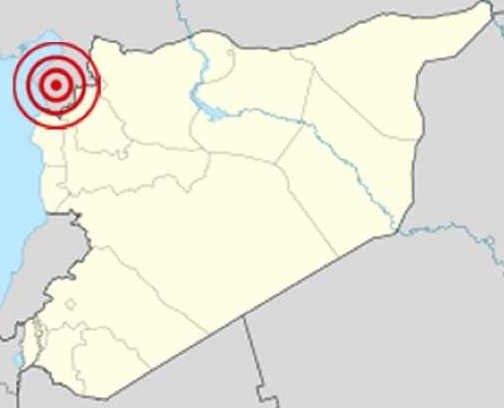 The earthquake in the Orontes valley, of an estimated magnitude of 7.5 on the Moment Magnitude scale (MMS), almost totally destroyed Antioch, Daphne and four other ancient cities including Apamea. It was felt all over the near East and the Eastern Mediterranean up to Rhodos and triggered a tsunami that hit the harbour city of Caesarea Maritima in Judea. Antioch on the Orontes was one of the most important cities of the Graeco-roman period. It was founded in 300 BC by Seleucus I, one of Alexander the Great’s generals, and became the Seleucids’ capital city. The ancient city stood on the eastern side of the Orontes River. It is currently partly covered by the modern city of Antakya (Turkey). Its location destined Antioch to be a mixture of diverse cultures as well as a trading centre. Caravans from Asia Minor, Persia, India travelled through the city where exchanges on a large scale were conducted. After Rome conquered Syria in 64 BC, the city became a Roman stronghold. Roman culture added to the city’s luxury with a forum, an amphitheatre, baths, a hippodrome, a theatre, a great collonaded street (Via Triumphalis) and an aqueduct carrying water to fountains, public buildings and villas. The city was thriving and was known as the “Queen of the East.” At the time of the earthquake of AD 115 Antioch had a population of about 500,000. The most vivid description of the catastrophe came from the Roman historian Cassius Dio. In his Roman History (Book LXVIII), he described how Antioch was crowded at the time of the earthquake due to the emperor Trajan overwintering within the city. While the emperor was tarrying in Antioch a terrible earthquake occurred; many cities suffered injury, but Antioch was the most unfortunate of all. Since Trajan was passing the winter there and many soldiers and many civilians had flocked thither from all sides in connexion with law-suits, embassies, business or sightseeing, there was no nation of people that went unscathed; and thus in Antioch the whole world under Roman sway suffered disaster. He then painted a dramatic picture of the destruction witnessed by the population. First there came, on a sudden, a great bellowing roar, and this was followed by a tremendous quaking. The whole earth was upheaved, and buildings leaped into the air; some were carried aloft only to collapse and be broken in pieces, while others were tossed this way and that as if by the surge of the sea, and overturned, and the wreckage spread out over a great extent even of the open country. Soldiers and civilians were killed by falling debris while many others were trapped. The aftershocks that followed the earthquake for several days killed some of the survivors, while others, trapped in collapsed buildings, died of starvation. And as Heaven continued the earthquake for several days and nights, the people were in dire straits and helpless, some of them crushed and perishing under the weight of the buildings pressing upon them, and others dying of hunger. 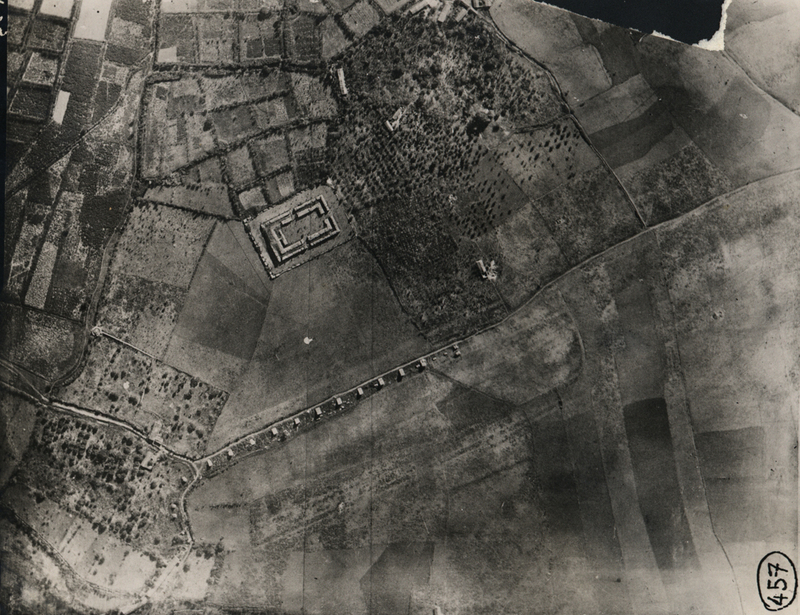 Trajan survived and escaped with only minor injuries but was forced to take shelter in the circus as the aftershocks continued for several days (see an aerial photo of circus of Antioch here). Trajan made his way out through a window of the room in which he was staying. Some being, of greater than human stature, had come to him and led him forth, so that he escaped with only a few slight injuries; and as the shocks extended over several days, he lived out of doors in the hippodrome. Unfortunately, nothing is reported on how Plotina, Trajan’s wife, or Hadrian managed but they obviously survived unscathed. Many soldiers, including members of the imperial entourage, perished. One of the most prominent victims was the consul ordinarius Marcus Pedo Vergilianus. In total 260,000 are said to have died during or in the aftermath of this event. The population of Antioch was reduced to less than 400,000 inhabitants and many sections of the city were abandoned. 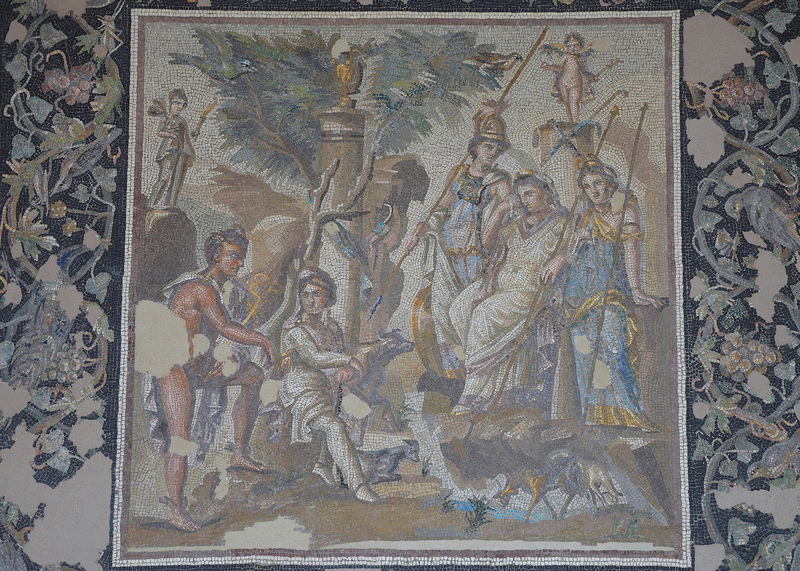 Mosaic of the Judgment of Paris, 115 – 150 AD. It was discovered in 1932 in Antioch in the Atrium House. This panel was placed in the floor of a dining room which was redone shortly after the earthquake of 115 AD. Now in the Louvre, Paris. Soon after the disaster, Trajan started to restore the city. Since the 6km long aqueduct running between Daphne’s springs and Antioch was seriously damaged, Trajan began the construction of a new aqueduct or repaired an existing one he had built earlier (see an image showing the masonry on the aqueduct of Trajan here). As Trajan did not live to finish the project, work on the aqueduct was completed by Hadrian. 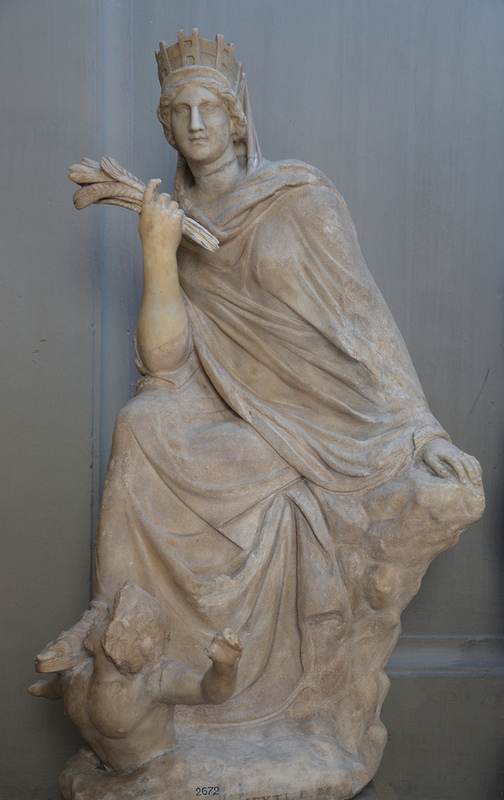 According to the 6th century AD chronicler John Malalas, a native from Antioch, Trajan commemorated the rebuilding of the city by erecting a gilded copy of the Tyche of Eutychides in the theatre. Tyche was the patron deity of Antioch. She was a goddess who presided over the prosperity of the city, bringing hope and good fortune to its citizens. The most renowned sculpture of Tyche was a bronze statue by the Greek sculptor Eutychides, a pupil of Lysippos, created for the city of Antioch in the early 3rd century BC, the best extant version of which is in the Vatican Museum (see below). 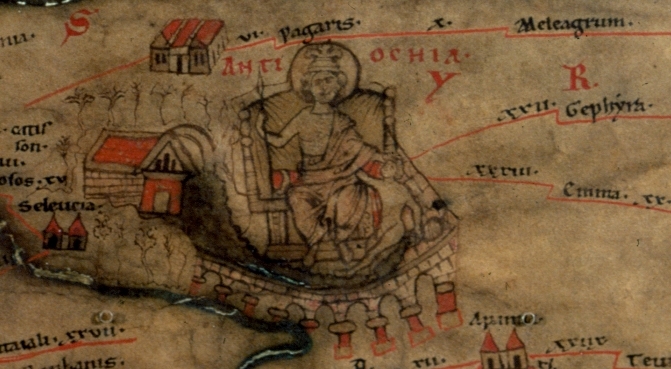 It shows the goddess, crowned with towers, seated on a rock, symbolic of Mount Silpius, with her feet resting on the river Orontes, depicted as a swimming youth. The Tyche of Antioch. Marble, Roman copy after a Greek bronze original by Eutychides of the 3rd century BC. Galleria dei Candelabri, Vatican Museums, Rome. Like his predecessor, Hadrian improved the water supply to Antioch. 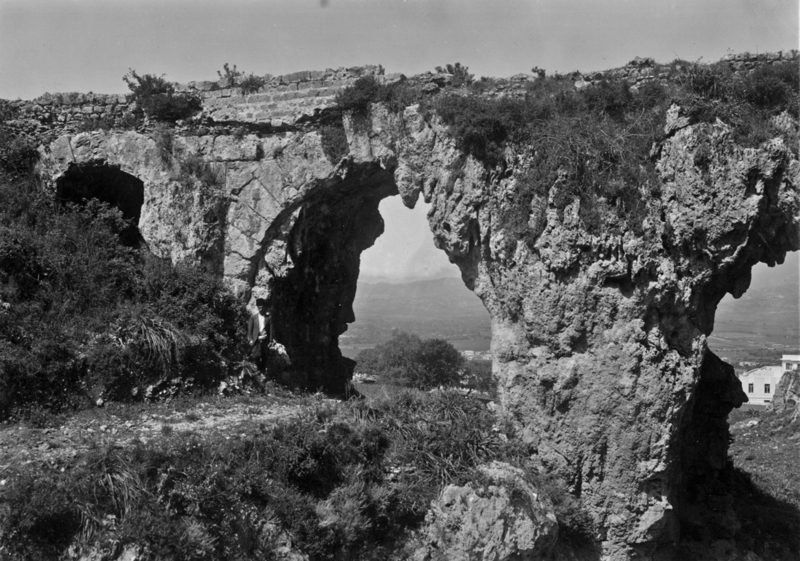 In addition to the completion of the repairs done on the aqueduct, Malalas records the building of a theatron (a theatre-like water reservoir that may have resembled the Hadrianic reservoir at Zaghouan, as suggested by Richard H. Chowen) and a Temple of the Nymphs at the springs of Antioch’s suburb Daphne which contained a great statue of Hadrian. One year and eight months after the earthquake, on August 11 of AD 117, Hadrian was proclaimed emperor by the army in Antioch. He remained in the city until September 117 when he set out to reach Rome. Antioch will be the start of my Hadrian1900 project. Unfortunately, not much is left to see of ancient Antioch. However, I will make sure to visit the archaeological museum, which has one of the best collections of ancient mosaics in the world (see loads of beautiful images here). ¹ The date of December AD 115 appears to be established by John Malalas as well as in the Fasti Ostienses as restored by Vidman – [ID(ibus) Dec(embres) terrae m]otus fuit. However the date is subject to debate among scholars. Anthony R. Birley believes the earthquake took place in January AD 115. If you are visiting Antakya, do try to get to Demirkapi, the Iron Gate. It’s amazing. Thank you! I am planning to visit Antakya in 2017 and I will definitely visit this place. The view around the gorge is fabulous! It’s a great little city. And the museum has some amazing pieces, although my visit was a bit tricky because they were packing some of it up to move to the shiny new museum. I’m going to have to revisit some time.